Emaar Properties’ $1.5 billion initial public offering of its United Arab Emirates development business received bids for the entire amount within half a day of the issue’s opening. The developer of the world’s tallest skyscraper is offering 800 million shares in Emaar Development at a price range of between 5.7 dirhams ($1.55) and 6.9 dirhams per share, the Dubai-based company said in a statement to the bourse on Thursday. The books are fully covered by institutional investors’ bids, according to terms obtained by Bloomberg. The offering opened on Thursday, with about 10 percent of the shares available to retail investors and 90 percent to institutions. The sale would be the largest since Emaar Malls PJSC’s $1.6 billion offering in 2014, according to data compiled by Bloomberg. It’s part of Emaar’s plan to list subsidiaries to help boost the value of the parent, which spearheaded a building boom in Dubai after foreigners were allowed to own properties in some parts of the emirate in 2002. Emaar, Emaar Malls and the company’s units in Saudi Arabia and Egypt are already listed. The high-end of the offer price represents a premium of as much as 15 percent to the company’s net asset value and the lower end a 5 percent discount, according to Bloomberg calculations. Emaar said October 22 the unit had a net asset value at 24.1 billion dirhams at the end of September, or 6.025 dirhams a share. Competitor Damac Properties trades at a 15 premium to net asset value, according to Bloomberg calculations. Emaar is selling 20 percent in the unit, which expects to pay at least $1.7 billion in dividends over the next three years in about equal installments. That would imply a dividend yield of at least 7.5 percent at the top end of the price range. Damac trades at an indicated dividend yield of 6.4 percent, according to data compiled by Bloomberg. The IPO is an “opportunity to invest in the future of Dubai as we continue to build iconic freehold master-planned communities,” Emaar chairman Mohamed Alabbar said in the statement. 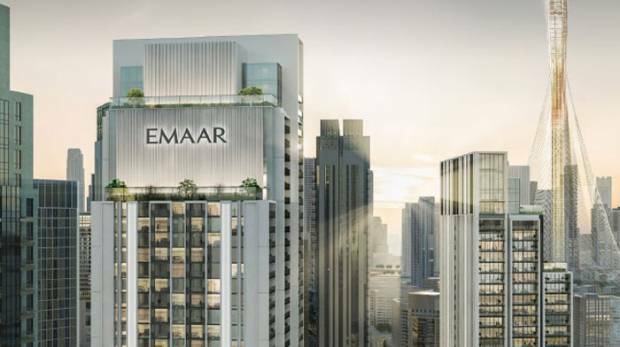 Emaar Development has a clear growth strategy, projects in premium locations, “underpinned by Dubai’s transformation from regional to global destination,” he said. The offering to retail investors closes November 13 and to qualified investors on November 15, with the shares to be listed on the Dubai Financial Market on November 22. The final offer price is expected on November 16 after a book building process. Bank of America Merrill Lynch, EFG Hermes UAE Ltd, Emirates NBD Capital, First Abu Dhabi Bank and Goldman Sachs Group are acting as the joint global coordinators for the offering, while Emirates NBD and FAB will be the lead receiving banks. Rothschild is the financial adviser.